I personally kept referring to a great page from BBG website with the full list but as it was in a forum there were a few too many comments to make easy reading I shortened it to an easy list. I'll post the complete list here and upload it to the WW1 files section. 5 player mats, 2 rulers, 1 "A" damage deck, 4 manuever decks: A, B, C, & D., 32 counters. 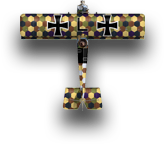 Ufag C.I - Flick 66/K - Kaiserliche und Koenigliche Luftfahrtruppen (Austria), pilot and gunner unknown to be used with Wings of War - Watch Your Back! Nieuport 17 of Maresciallo Ernesto Cabruna, 80a Squadriglia Regio Esercito (Italy) - color scheme identical to another Ni.17 in Burning Drachens. "Lightning Bolt" SPAD XIII of Captain Harvey Weir Cook, 94th Aerosquadron U.S. Air Service, that is meant to be used with "WoW - Famous Aces". 2 player mats, 2 maneuver decks: I & J., Altitude cards for all the deck in Fa and WyB, 2 rulers, 1 "A" damage deck, 1 "C" damage deck (Anti-Aircraft), 1 "D" damage deck. (Rockets), 4 double-sided Balloon cardboard pieces, Various counters. 2 maneuver decks: L and M.
These are the plane cards in the booster (last three are promotional ones). 3 maneuver decks: 2x P and a G.
3 maneuver decks: K and 2x S.
2 maneuver decks: B and Q. 4 maneuver decks: A, B, C & D.
Counters and additional ground target, trench and bomb cards. 13 .Wings of War: Miniatures - Series 1: Each miniature comes with its maneuver deck and the plane card. 14 .Wings of War: Miniatures - Series 2: Each miniature comes with its maneuver deck and the plane card. 15 .Wings of War: Miniatures - Series 3: Each miniature comes with its maneuver deck and the plane card. 16 .Wings of War: Miniatures - Series 4: Each miniature comes with its maneuver deck and the plane card. - 9 decals: 3 German crosses on white squared background, 3 German crosses with no background, 3 French roundels. - 4 Nieuport 16 airplane cards for Johnson, Prince, de Guibert, Grandmaison. - 1 R maneuver deck for the Nieuport 16. - 1 altitude table card. - 9 decals: 3 US roundels, 3 British roundels, 3 Russian roundels. The 2 Wings of War game mats are large, 98 x 68cm (38.6 x 26.8in), about the size of an average poster, made of a durable rubber foam with fabric bonded to the top, similar to a mouse pad. The game mats are sold as two halves of the same battlefield, East section and West section. Combined, the total size of the battle field is 98 x 136cm (38.6 x 53.6in). There used to be a well maintained excel version of this with additional plane information from both real life and in game (maneuver deck, damage deck(s), durability) etc. I wonder if someone would be willing to mesh the two and update it with an "official" refresh of the data! Sparty, good to hear from you! :I will save this list too, I didn't know the Hit and Run booster Pack has 31 airplanes.Now I don't know if I buy the Immelmman or the Hit and Run. Yeah, of course karl! !Is just because in Brazil is hard to find Wings of War or Wings of Glory. Last edited by Nick_ace; 12-12-2012 at 14:47. You'll need a blank card for WWII large fighters/WWI small bombers, and another for WWII bombers/WWI large bombers. There are 2 lists, one for official, one for unofficial aircraft. 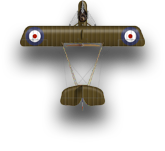 The Official list is slightly obsolete - the Sopwith Triplane now uses a (new) U deck, not a D one. The Unofficial list will replace all J* decks with the (new) V deck, and the Halberstadt CL.II will move to the Official list. Other stats for it may change too. The Fokker D.VI will use the new U deck rather than the M deck. Yep, you're right. Watch Your Back does come with a couple Siemens-Schuckert D.I. While have a glass of wine in the Officer's Mess tonight some discussion came up and I wanted to pick the collective brains here. So. There is some scuttlebutt here and there regarding the expansion/supplemental boxes/blisters that some planes - notably an AEF DH.4 and a RAF DH.4 can use twin MGs; fore or aft, maybe even fore and aft (front and rear to you lubbers I know some minis have twin mgs fore and/or aft molded on them. Fore ; ) example, the Hanriot HD. (Fucini) and Airco DH.4 (Cotton/Betts) minis have twin for'ard mgs and the Aussie Bristol F.2B (Headlam/Beaton) mini has twin aft mgs. My question/quandary then is: are there cards in say, "Watch your Back" that have plane cards or pilot cards to use twin mgs? And for example would one be obligated to find the exact crewed super rare birds - or could one use any DH.4 to fill the bill in the above example using the applicable supplement/blister card? Very keen to hear thoughts, and if possible please cite references on this matter. Drat. My wine has evaporated. Except for the DH.4 Miniatures that have only one MG sculpt, all of the others have one or two MG sculpt. Thank you Tim, they are added in the previous post. Actually, Collishaw has an A.
Dallas and Little have a B. One small detail, which is not very important as these models are so rare, but there were two aeroplane cards in with Boudwin's S.E.5a. One was A damage as normal and the other B damage because the U.S. forces were short of Lewis guns. So, who is going to use that one (and snap the gun off their Boudwin model)? Actually, Tim, my Boudwin model has a loose Lewis gun, which comes off, but you can always pretend that the Lewis gun is absent just as we pretend that the Cotton/Betts D.H.4 only has one Vickers gun. ............................ you can always pretend that the Lewis gun is absent just as we pretend that the Cotton/Betts D.H.4 only has one Vickers gun. Yeah, I know, that's obvious, and goes without saying; my point was - given the option, I'm willing to bet that no one but me will ever play the 'B' gun version voluntarily. When I'm not what-if-ing, I have a bent to this myself. Besides, there's the bragging rights to taking out your opponent with one hand tied behind your back. Once while doing some research here, I found a matrix/graph of the planes that use which maneuver decks. But now I can not find it. Can someone put a link here? Also, but related, which planes now use the new "U" Decks besides the Sopwith and Fokker Triplanes? Only the Sopwith Triplanes has deck U. The Fokker DrI is D.
I think you meant the Fokker D.VI uses the 'U' deck, not the Fokker Triplane? I don't know of any other 'U'deckers. ... I'm willing to bet that no one but me will ever play the 'B' gun version voluntarily. If I'm playing historical scenarios, B-gunned RFC planes often run up against A-gunned German planes. Sopwith Triplanes and Nieuport 17s in April-June 1917 for instance. I usually fly Collishaw in his B-gunned Triplane (repaint), with the rest of the Black Flight, as he only flew the A-gunned version for two weeks.